how to make almond milk from scratch at home. 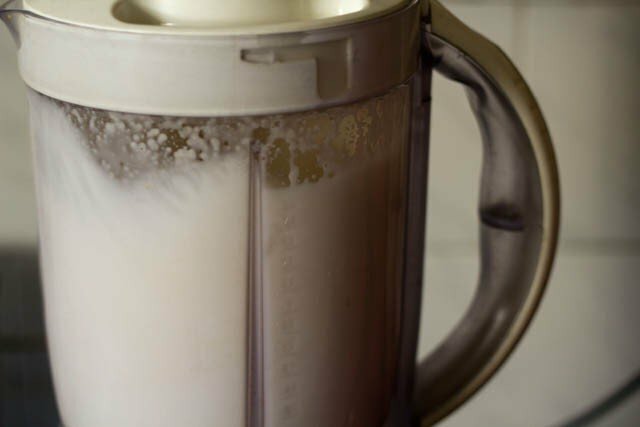 almond milk recipe from scratch – i have been using a lot of nuts milk (cashew and almond milk) and soy milk in my diet. 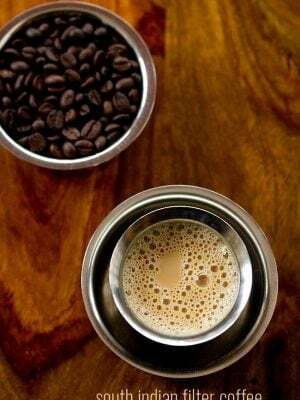 the morning chai is made with soy milk or cashew milk. in the cakes or breads that i make i add these non diary milks or water. after having almond milk a couple of times, i have got hooked on to it. its so good. especially for a milk hater like me. i could never just have plain milk even with sugar. its easy on the tummy and there is no after milk smell in the palate. its also good for kids who are allergic to milk or have lactose intolerance. 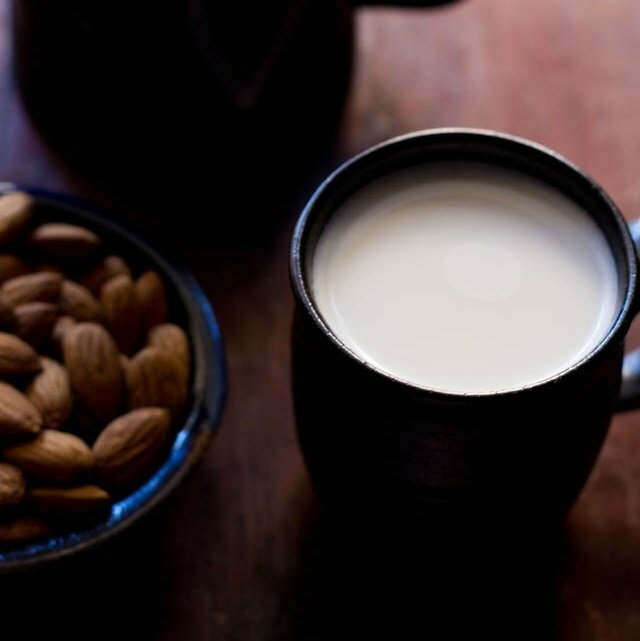 almond milk can be had plain or sweetened with some sugar or jaggery or honey. if you like chocolate, then warm the milk and add some cocoa powder and you have a nice warm chocolate drink. you can even mix cereals or fruits with the milk. 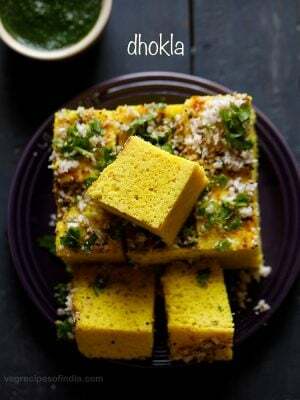 we use almond milk not only as a beverage, but i also make my favorite desserts like vegan vermicelli pudding, vegan carrot halwa, mango kulfi and fruit custard with it. recently i made strawberry falooda with almond milk and it was truly awesome. 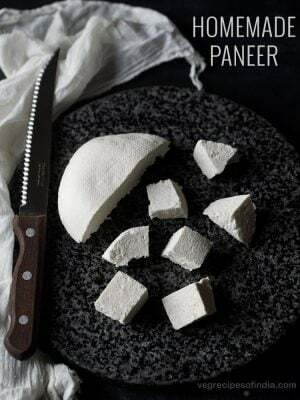 so after making a few indian desserts with almond milk, i have come to the conclusion that almond milk substitutes very well with cow’s milk in making indian sweets. i also added it in milkshake likes strawberry almond milkshake and mango milkshake recipe. 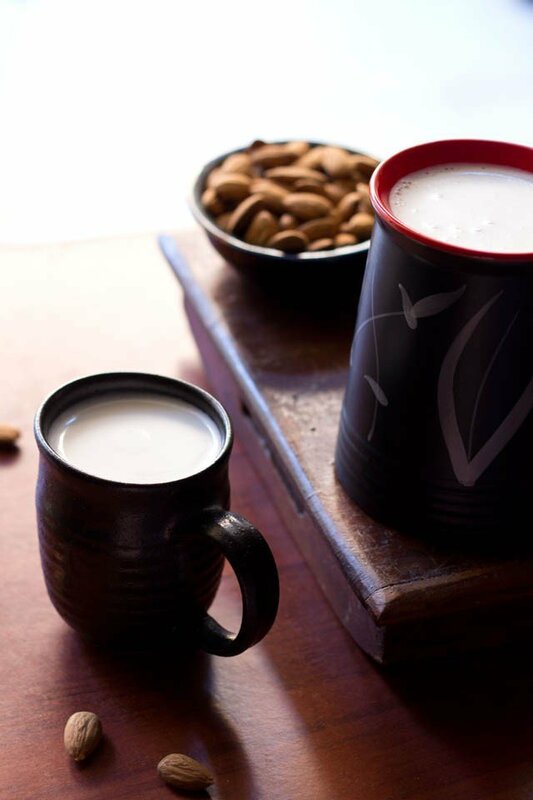 the consistency of almond milk is similar to diary milk but it has a refreshing taste & flavor unlike cow’s milk. again there are added health benefits of having almond milk everyday. in the refrigerator the almond milk stays best for 3-4 days. cover and let the almonds get blanched for 30-45 minutes. when the almonds are soaked well, drain the water. peel of the almonds one by one. blend the peeled almonds with 3 or 4 cups water in a blender. collect the almond milk in a bottle or jar. keep almond milk covered in fridge. almond milk stays good for 3-4 days. 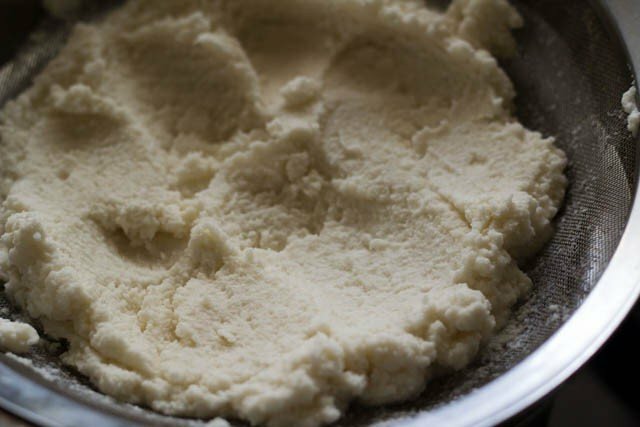 the leftover almond paste can be used in cakes, cookies or making breads. the almonds can be soaked overnight also. 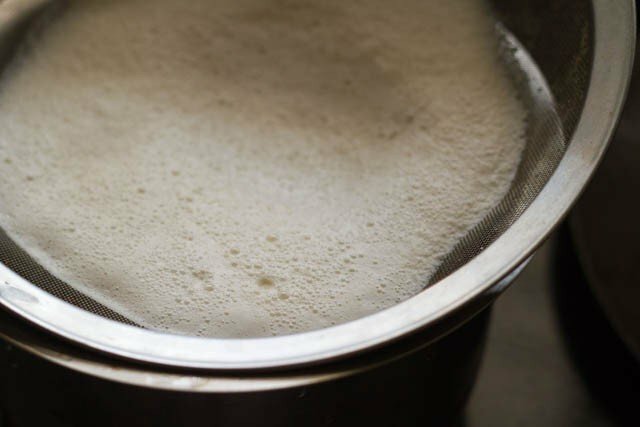 the almond milk can be strained in one go or twice or thrice. 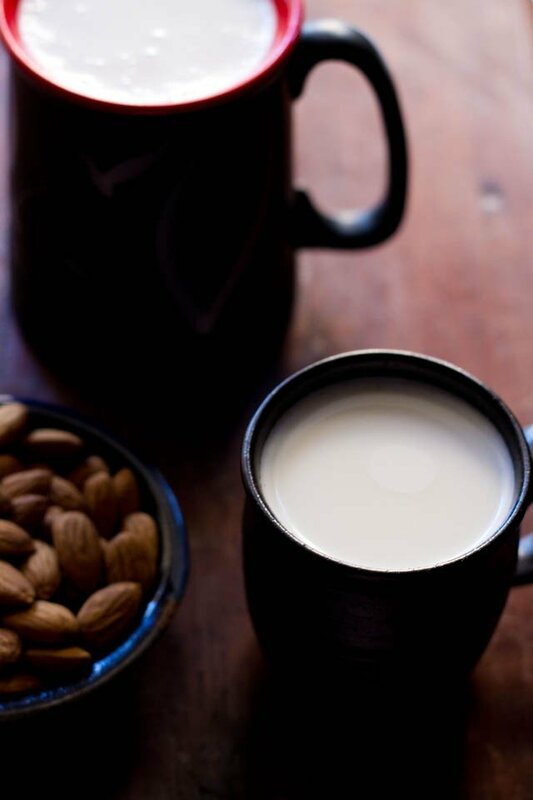 for a thick milk, first blend the almond with 1 or 2 cups of milk and then strain. this will be a thick milk. collect the pulp in the blender. add 2 cups water and blend again. strain and this will be the thin milk. in the refrigerator the almond milk stays best for 3-4 days. so make as per your need. 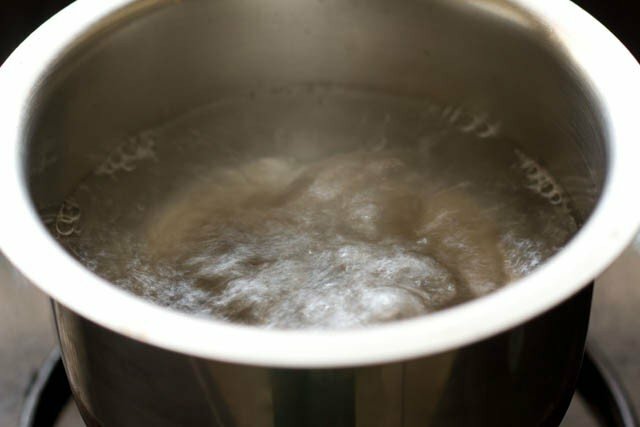 1: boil water and switch off the flame when the water becomes hot and starts boiling. 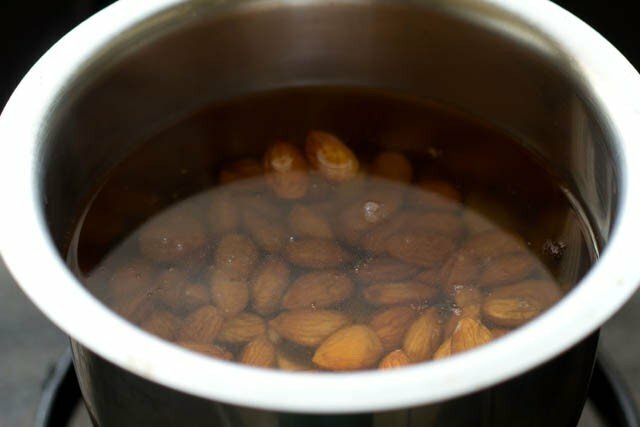 2: rinse the almonds and add these to the boiled water. 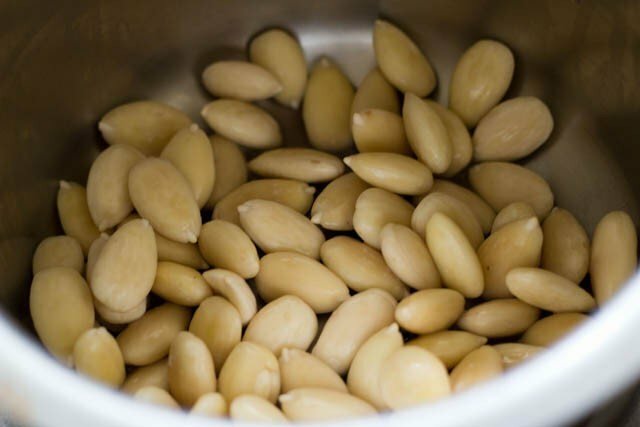 cover with a lid and let the almonds get blanched for 30-45 minutes. i blanch the almonds as its easier to remove the peel. you can also soak the almonds overnight. but i find peeling soaked almonds cumbersome. the peels just don’t come off easily. you can keep the peels if you want. i remove them as they irritate our throats when they are ground. 3: drain the water. this water you can cool and give it to your plants. just press the peel of the almond between your thumb and forefinger and the peel comes off easily. remove the peels of all the almonds this way. 4: now add 3 cups water in the blender along with the almonds. blend till smooth. 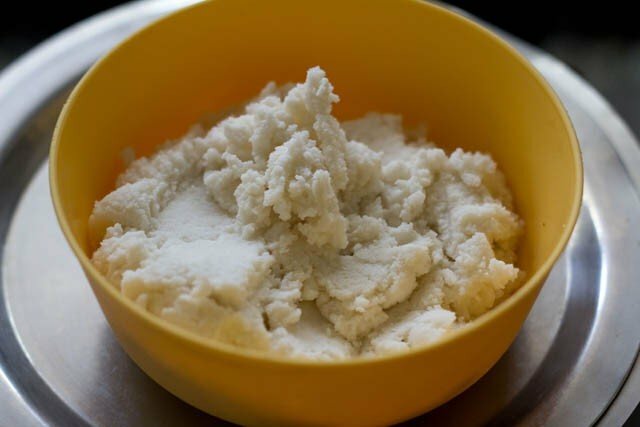 5: using a juice strainer/fine sieve/muslin/cheese cloth bag strain the milk keeping a large bowl or pan below. 6: you will see the milk filtering down and the almond pulp on the strainer. press the pulp with a wooden spoon or non reactive metal spoon. 7: now take this pulp back into the blender and add 1 cup of water and blend again. this part is optional. you can just blend the almonds with 4 cups water and then strain the milk once. strain again. 8: press with the spoon again so that all the milk is extracted from the pulp. 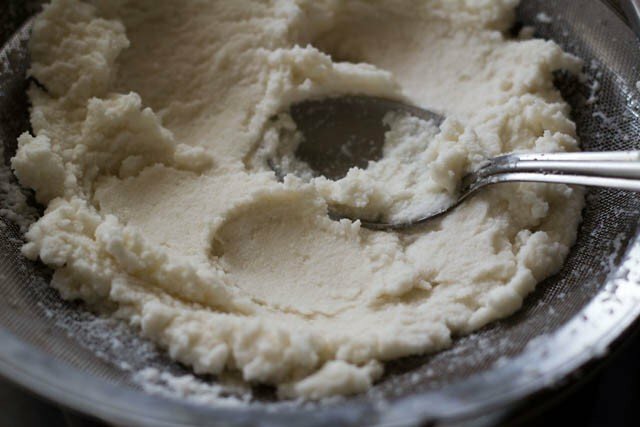 9: collect the leftover almond paste and freeze or refrigerate it. 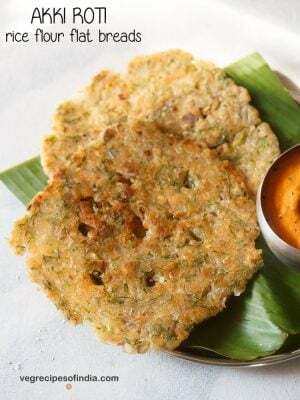 you can add this to your roti dough, bread dough and even sweets. or just roast them in a pan till they become dry. grind in a dry grinder and you have homemade almond flour which you can add to your tarts, cookies, cakes, breads etc making it excellent to make gluten free goodies. 10: collect the almond milk in a ceramic or glass jar or glass bottle. keep the jar covered. keep in the refrigerator. 11: use almond milk whenever required to make your favorite drink or just have it plain. 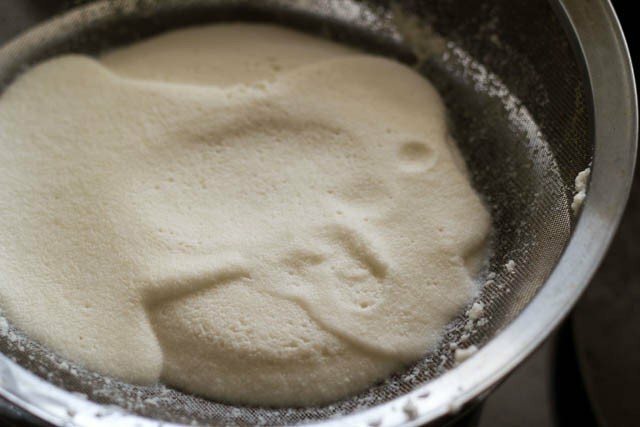 stir the jar or bottle before using the milk as the heavy particles settle down. for a warm drink, just warm the milk, don’t boil. boiling or overheating will cause the almond milk to separate and lose all its taste and flavor. or just have the almond milk as it is. 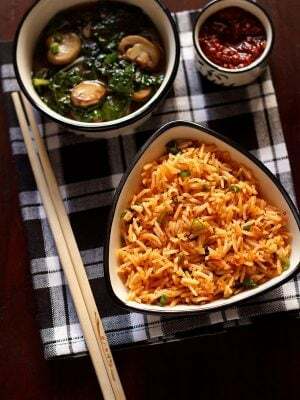 Thanks a lot for sharing the recipe in such an easy way and in detail. My daughter turned vegan. And as a mother I want to support her in all possible way including trying vegan recipes in day today life. This is most useful. Just wanted to know, if we can use this milk in summers too? As it is said that almods are garam in taseer. nidhi, if you soak the almonds overnight then the heat factor is reduced much in them. 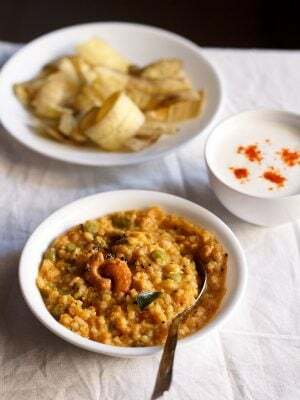 we use soaked almonds in thandai also. Thanks. That makes perfect sense! Can I make almond milk with already ground almond. I bought ground almonds. kadii, i don’t know. i never tried this way. Hi! I simply loved your recipe. But I have a doubt. I recenyltly came across a cake recipe that requires almond milk in it. Can I use this almond milk to bake cakes? thanks hetal. yes you can use this almond milk in baking. I prepared the almond milk using the receipe. Came out very well. Add date syrup for sweetness. Also used this to make avacado milkshake. My family loved it. welcome lakshmi and thanks for sharing your inputs. Hi, really the this post made the process seem so simple, I wanted to ask what is the shelf life of this milk? just 2 to 3 days in the refrigerator. I have a question. Where do you buy your organic almonds? I love almond milk and would love to make it all over again but the organic shops sell it in 100 g-packs and totalled up to bigger amounts (which will be required for constant almond milk making) will be expensive. I’ve read that almonds get sprayed a lot, so it’s important to get them organic. On the other hand cashews cannot take pesticides well, so again I’ve read that cashews could also be bought non-organic if required. Do you agree? I’d love to get a tip from you in this regard! Thanks! hi minni – firstly thanks a lot. i had actually got these almonds from an organic fair. i had got in bulk. i have seen 500 gms organic almonds and cashews from down to earth organic brand. living in goa, i have seen cashew trees not being sprayed with pesticides. they grow so much in abundance there and wildly too. so cashews can be brought non organic. even i buy non organic cashews. however almonds i prefer to buy them organic. thanks again for the lovely blog..
thanks sheeba for the motivating comment as well as for your helpful tip. such tips are always welcome and appreciated. I tried this at home, and the almond milk was really yummy!! My husband and my little baby loved it, it has become kind of regular at my home now. Thanks for sharing such nice recpies! Thanks for sharing this and for your pictures! I’ve wanted to make almond milk for a while now, will definitely try!! any idea what went wrong or we cannot make tea with almond milk. soak 1 cup cashew for 1-2 hours. drain and then blend very well with 3 or 4 cups water. it should be smooth. 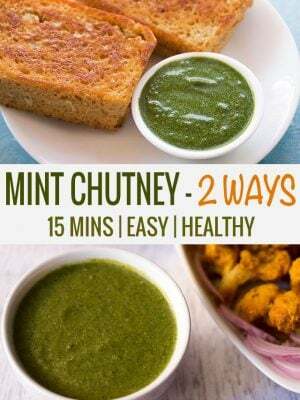 pour in a jar and keep covered in the fridge. stays good for 4-5 days. 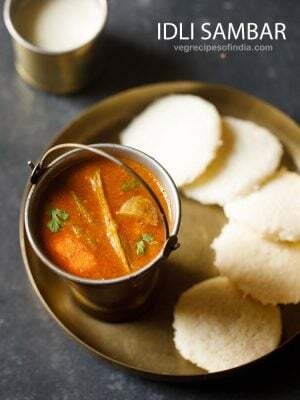 Almost like coconut milk preparation. And you can use all the products too. i have a slight lactose intolerance to milk but not milk prodcuts. i make nut milks as a part of my vegan living. 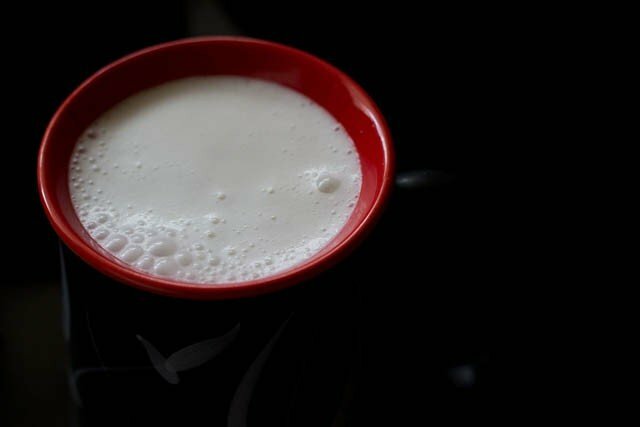 even before going vegan i would never have plain milk, and just very little milk with tea. the almond milk looks so delicious and inviting that I am craving some post my tummy full dinner!